PCS | Ipswich Unemployed Action. Universal Credit Call-Handlers Voting on Strike. Universal Credit call handlers will vote on whether to hold a major strike after being treated with “contempt”. The Mirror reported this a few days ago. It follows numerous articles on the PCS site, and – in person – a speech from a PCS representative in Ipswich which outlined the problems. Up to 295 Department for Work and Pensions (DWP) agents in Wolverhampton and Walsall are poised to walk out for two days in a row over heavy workloads. The PCS union says the system is crippled by “severe under investment, staff shortages and criticism from claimants on how they are treated”. Chiefs are demanding 5,000 new staff, full contracts for fixed-term workers, an end to “management by statistics” and a limit on the number of phone calls each case manager has to handle. It comes after top Tories heaped praise on rank-and-file staff in their defence of the six-in-one social security shake-up. PCS general secretary Mark Serwotka said the strike ballot – which runs to February 25 – must be a “wake-up call” to ministers. The ballot could lead to two days of strike action next month at the Wolverhampton and Walsall service centres, with up to 295 staff being balloted for both strike action and action short of a strike. The union said that the rollout of the government’s flagship welfare reform, which will merge six existing working-age benefits into one payment, has made some DWP staff’s workloads unmanageable. PCS has made five demands of DWP to ease the pressure. These include hiring 5,000 new staff nationwide and permanent contracts for fixed term staff to increase capacity as more people transition onto the new benefit system. It also wants the department to limit the number of phone calls per case manager, commit to service centres rather than contact centres, improve staff consultation, and a implement quality-focused working environment, with an end to management by statistics. The union’s general secretary, Mark Serwotka, said: “The possibility of a strike by Universal Credit staff should serve as a wake up call to ministers who have repeatedly insisted Universal Credit is working well for workers and claimants when the opposite is in fact the case. The ballot will close on 25 February. Responding to the announcement, a DWP spokesperson said the department was determined to give all employees, including those delivering Universal Credit, the necessary resources to carry out their roles successfully, including manageable workloads. The size of a case manager’s workload depends on a number of factors, including their experience and the complexity of the caseload, they added. “We are disappointed that PCS has chosen to take this course of action and planned meetings with the union are ongoing,” the spokesperson said. Controversial changes to the benefits system are leaving Welsh councils with hidden costs, it has been claimed. Universal credit aims to make claiming simpler by combining several benefits. But 16 of Wales’ 22 councils said the UK government is not covering the full cost of assisting claimants, including teaching IT skills needed to apply. The Department for Work and Pensions (DWP) said councils can apply for reimbursement of additional costs, but councils denied that was the case. The body representing councils, the Welsh Local Government Association (WLGA), and Welsh local government minister Julie James said the rollout of the benefit was not working. Universal credit has to be applied for online, and will eventually replace housing benefit, income support and other payments. At the moment councils can reclaim some money for each person they help who needs support with digital skills and budgeting to cope with the new system. Wales’ 22 councils estimated the total bill for providing that help was more than £1.2m last year – even after claiming payments from the DWP. A small group of Labour supporters hung a banner over the balcony before Redcar and Cleveland’s Borough Council meeting. February’s meeting of Redcar and Cleveland’s Borough Council went on for more than three hours – and didn’t even cover its agenda. Even before councillors had taken their seats, there was a heated exchange in the public gallery. 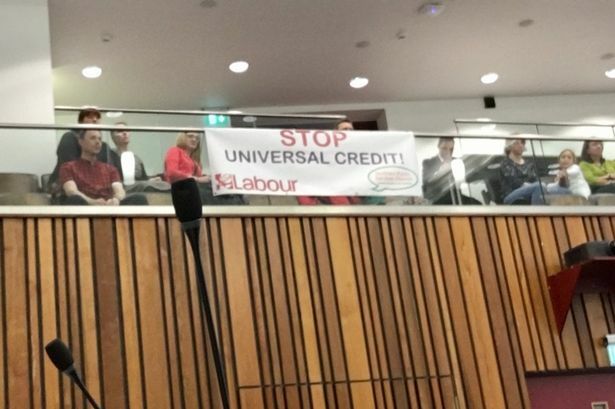 A small group of Labour supporters had hung a Labour Party banner over the balcony which read “STOP UNIVERSAL CREDIT”. But, with the banner secured to the balcony with rope weighted down on one side by a hammer tied and a chisel on the other, one member of the public took objection to the display. “Get rid of these offensive weapons – they’ve been put here by the Labour Party,” he said. “We have a right to protest,” said one of the protesters. “Not with offensive weapons you don’t,” objected the man. In the end, an officer solved the problem by removing the tools and securing the ropes with tape. In her opening address, council leader Cllr Sue Jeffrey, once again called for the controversial roll-out of Universal Credit should be postponed. But because it takes five weeks to receive a payment after making a claim, hundreds of families in Redcar and Cleveland were left facing a Christmas with no money. She said the DWP hadn’t yet provided figures of how many people had made new claims for Universal Credit over Christmas but added that the council’s own records suggested around 2,100. She said there had been an 80% increase in requests for personal budgeting support and 52 residents who approached the council for help with the new online system. Labour Needs Policies to Replace Universal Credit to Rebuild the Welfare State. “We need to see a Corbyn government commit to overturn decades of attacks on and ridicule of benefits claimants and return to the founding principles of a properly-resourced welfare state” PCS General Secretary Mark Serwotka. A number of our commentators have been, rightly, dissatisfied with the lack of a strong Labour voice, above all, Labour Party Policy, on welfare issues. These range from silence on the benefit freeze (which needs to be ended), to an alternative to the Universal Credit car-crash. There remains talk about a pause to implementing Universal Credit (a 2017 petition – a bit late now). The acting Shadow Secretary for Work and Pensions, Margaret Greenwood, seems to have said little since just before the long summer holidays, apart from continuing to criticise government policies (“Delays in payments of Universal Credit are sending victims back to abusive partners – Margaret Greenwood.” August the 1st). REVEALED: Universal Credit makes it easier for domestic abusers to control family finances – and makes it harder for victims to leave. Basic Income aside what are Labour policies, from funding to changing the whole miserable punitive structure of the benefit system? What are Labour’s plans to fix Universal Credit? No straightforward ideas seem available. • the 8 August ONS figures showing that improvement in life expectancy has virtually stopped. • the 6 August Child Poverty Action Group report on how Universal Credit’s flaws are leading to low-income families arbitrarily losing as much as £258 a month! • the July Resolution Foundation figures showing the poorest third’s incomes fell last year, even before inflation. The situation is shameful. We must reverse the drive, accelerating since 2010, to make welfare less and less about supporting those in need and more and more stingy, punitive and coercive. 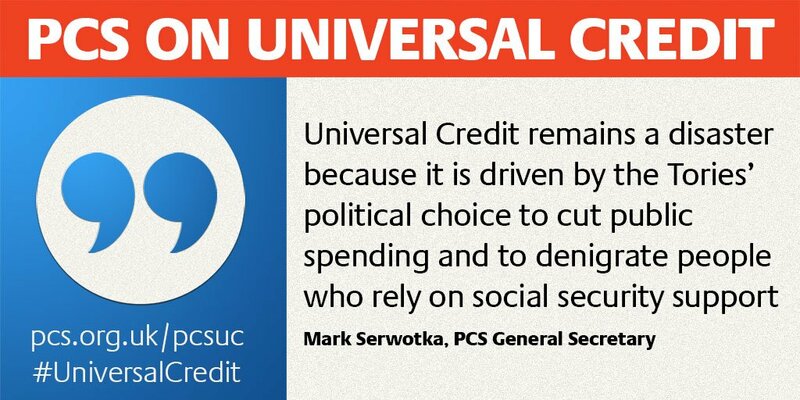 Neither Universal Credit nor the existing framework (JSA, ESA, etc) are good. We must redesign benefits in close consultation with recipients, workers and their organisations. This must be part of a wider anti-poverty program, with a goal that by the end of our first term foodbanks disappear. 1. Ending the benefit freeze; uprating with inflation or earnings, whichever is higher. 2. Reversing all cuts/reductions; increasing benefits to afford a comfortable, not minimum, income. 3. Entitlement conditions that are straightforward, inclusive and available to all, including migrants (scrap ‘No recourse to public funds’). 4. Paying benefits for all children and dependents. 6. Scrapping Work Capability and similar assessments. 7. Relevant health issues being addressed using medical professionals with appropriate knowledge of individuals’ conditions and impairments. 8. Delivery by paid public servants via networks accessible to everyone, including provision of face-to-face support for all who need it. Reversing DWP cuts and privatisation. Whether this gets onto the agenda or not there are people calling for some serious policies. Labour must commit to over-turning years of cuts to social security benefits and end the stigmatisation of benefit claimants seen under Tony Blair and the current Tory Government, PCS General Secretary Mark Serwotka said at a TUC Congress fringe meeting on Tuesday. Mark told the meeting held in Manchester that the current benefits system in “broken” and “causing much difficulty for people claiming benefits”, whilst adding the Tory Government is seeking to cause divisions between “people in work, those who work in DWP and those in receipt of benefits”. He added that a future Corbyn-led Labour Government must “return to the founding principles of the welfare state that it is for all people and provide dignity for all people at all stages of their lives”. Mark also said the rollout of Universal Credit needs to he halted because the new system is in chaos and there aren’t enough DWP staff to deliver it. He added: “The starting point of the debate on welfare needs to be the founding principles of the welfare state that it is for all people and provide dignity for all people at all stages of their lives. Mark said that ‘New Labour’ took stigmatisation of welfare claimants to new levels and there was a lot of work to do to put that right. He said we need to see some radical welfare polices from a future Labour government that gives everyone a welfare system that we can all be proud of. £34bn has been cut from the welfare budget since 2012, with a further £12bn of cuts planned before 2022. “More money is needed as we have some of the lowest rates of benefits in Western Europe,” said Mark. Colin Hampton, co-ordinator of the Derbyshire Unemployed Workers’ Centres (DUWC), told the meeting: “If we can spend money on bombing people we can spend money on putting people into work. “We need to restore dignity and respect to people in and out of work”, he added. Steve Swainton, PCS DWP Group assistant secretary, told the meeting that Universal Credit had been a “debacle from the start”. Colin Hampton, co-ordinator of the Derbyshire Unemployed Workers’ Centres (DUWC), had a message to people who said that full employment was unrealistic: “If we can spend money on bombing people we can spend money on putting people into work. He said that we must all work to fill the current Tory vacuum on benefits policy and start to change the narrative about the way in which welfare is talked about in the UK. “We need to restore dignity and respect to people in and out of work,” he said. The DUWC has recently surveyed 100 Universal Credit claimants in Chesterfield and Colin said the findings were “horrific”. It contains reports of money being cut, claimants forced to borrow from friends and family because of large delays, lots of problems claiming online, struggles with housing costs and complaints about the use of sanctions. More than 50% of the respondents took a clearly negative view of their experiences under UC but praised the role of staff who tried to help them. Liane Groves, head of Unite Community which represents 16,000 benefits claimants across the UK, called for a radical alternative to the present system of welfare and scapegoating of benefits claimants. She also said that it was no surprise that inequality has increased in our society while the influence of trade unions has been reduced. Unite Community is holding a national day of action on 1 December to highlight changes claimants will face when Universal Credit is rolled out in January. Job Centre Plus Staff and Bullying Claimants. Members of the Public and Commercial Services Union (PCS) are engaged in the widespread bullying and intimidation of benefit claimants in Jobcentres up and down the country. The evidence can no longer be denied and the union’s leadership must now take steps to educate its members that solidarity is more than just a word on a leaflet during a PCS pay dispute, or else face the accusation of collaborating with the government’s vicious assault on the most economically vulnerable in society under the rubric of austerity. The upsurge in the number of claimants having their benefits sanctioned for increasingly minor infractions correlates to the upsurge in the demand for the services of the nation’s food banks. John Wight Huffington Post. Feburary 2014. Wight repeated this allegation yesterday on the site Socialist Unity. The majority of Jobcentre staff are members of the 270,000 strong PCS, the sixth largest trade union in the country, which represents thousands of Britain’s civil servants and public sector workers. The PCS has been a strong critic of the coalition’s austerity policies, making the case for an investment led recovery from recession and calling for mass opposition to spending cuts that have ravaged the public sector and been accompanied by a concerted campaign of demonisation of the unemployed and economically vulnerable that is unparalleled in its viciousness. This only makes the role some of its members are playing in intensifying the hardship faced by the unemployed and people on out of work benefits even more deplorable. He claims that the PCS is strong in the DWP – but in fact in Job Centres it is extremely weak. As could be seen in Ipswich where tiny numbers, if any, have participated in PCS strikes. Evidence suggests that JCP staff have referred many claimants for a sanction inappropriately or in circumstances in which common sense would dictate that discretion should have been applied. A limited independent review of sanctioning has been established by DWP. The Committee recommends that there should be a separate, broader independent review of the operation of benefit conditionality and sanctioning to ensure that the rules are being applied fairly and appropriately. This review should also investigate whether, and to what extent, sanctioning is having the desired effect of encouraging claimants to engage more actively in job-seeking. People looking for work have had their benefits stopped to meet government targets, the PCS union claims. The union, which represents many job centre staff, said they had been under “enormous pressure” to stop claimants’ Jobseeker’s Allowance. Some claimants said they had benefits withdrawn for “genuine mistakes” such as missing appointments. The government says sanctions are a “last resort”, and strongly denies the union’s claim. “Job centre staff are under enormous pressure to implement sanctions on unemployed people,” PCS union north-east regional secretary Simon Elliot said. “Staff are faced with the threat of sanctions themselves in the form of what they call performance improvement plans if they don’t impose sanctions. “If you look at the guidance for implementing the performance improvement plans it clearly states that it’s a measure against targets. Many rank and file members of the union have been all too aware of the suffering which is being inflicted on the poorest and often most marginalised people in the UK. PCS workers have marched, fought and taken direct action alongside claimants to fight the shambolic and callous welfare reforms. Two motions on how the PCS as a whole could now solidify that support had been proposed at the union’s annual conference in Brighton on 20 May this year. The motions have been excluded from the conference by the PCS leadership on the grounds that if successfully implemented they could leave the union liable to legal action. One of these motions calls for complete non-co-operation with the sanctions, which could be interpreted as a call for industrial action beyond the specifics of the law. The other motion however only calls to include the tactic of non-cooperation in “any industrial action campaign”. Not even this can be up for debate according to the leadership of the PCS. The UK workfare debates heats up… and it soon comes apparent that even yours truly Jobcentre Plus is using workfare participants to make up it numbers. Is Jobcentre Plus trialling workfare to replace its Admin Officers? No workfare participant will be able to undertake an Employment Officer role, however, DWP is cutting its “corporate administration budget” by 36% over 4 years. PCS is already upset with DWP plans to close contact centres and get rid of over 1,900 job vacancies. Labelled a staffing crisis and defending jobs as more centres scheduled to close. It is now clear, that the least important jobs could soon be replaced with workfare participants. Lets select 3 – magic number lol. Just to make it clear, you have to contact Jobseeker Direct to find out who the employer is with… they were a little too shy to place “Jobcentre Plus” or “DWP” in the employer box, however, of course its workfare not paid employment (although they pay your benefit so are in every way your employer). Technically speaking, “Secretary of State” holds the title… so you are in effect slaves of these persons (yes, the term applies to all Secretary of States – not just Work and Pensions). This is a work experience placement available to customers claiming Jobseekers Allowance with little or no work history. The placement is working at the Job Centre at St Andrews House in Bury St Edmunds. Through a combination of job-shadowing,mentoring and coaching, the participant will gain an overview of office administration. Duties including (but not exhaustive); filing, minute taking/general admin duties/use of IT and possibly use of telephone to contact customers. A full CRB check will be conducted prior to starting. Personal Advisers must ensure interested customers sign a work experience consent to share form. CV and JCP application form should then be sent to Bury St Edmunds EA team. With a wage of “JSA + TRAVEL”, hours of “25 – 30 per week” (was also in uppercase… ), location of ” EAST ANGLIA, IP33 ” and reference of “BSD/27427”. With a wage of “BENEFITS + TRAVEL EXPENSES”, hours of “30hrs per week” (was also in uppercase… ), location of “CRAMLINGTON NE23” and reference of “CRM/20576”. ***TELFORD Contact Centre*** TF3 4HB Working in a Contact Centre enviroment, Admin duties in an office enviroment. Will be expected to go to a 20 minute informal interview in the Telford room, Ground Foor, New Town house, Telford. START DATE: 19/12/11. ELIGIBILTY: Primarily aimed at younger JSA claimants aged 18-24 from week 13 up to referral to the Work Programme. There is discretion to refer claimants earlier than week 13 &, exceptionally, those aged 25+ who have no recent work history, & 16/17 where agreed – see guidance and/or RC. With a wage of “NA”, hours of “25” (how lazy), location of ” TELFORD TF3 ” and reference of ” TEL/64684 “. Please Note: Did you see the start date? Job was actually posted on the 6th February 2012… so it seems this job has been advertised previously and a lazy copy and paste job without bothering to read it. Do you work for Jobcentre Plus? Are you worried about your job? Are you a jobseeker? Would you work at Jobcentre Plus for no pay?